On the 8th of September Bishop Mouneer travelled to Ethiopia to join with Archbishop Josiah Fearon, the Secretary General of the Anglican Communion, Bishop Andrew Proud, the Bishop of Redding, Oxford, Rev. David White, the CEO of the Anglican Communion Office and Rev. Rajan Vincent, of Christ the King Anglican Church, Tripoli, Libya. 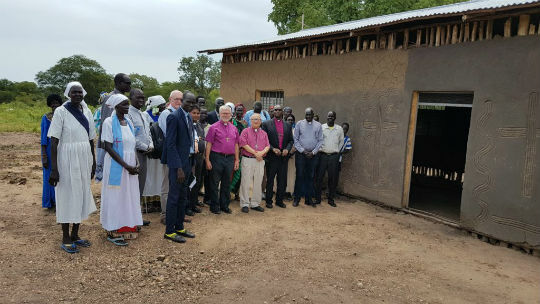 The purpose of the visit was for Archbishop Josiah to see the extent of the ministry in Ethiopia, especially the Gambela region, where the number of churches has grown from 7 in 2000 to 141 in 2017. "We were able to see the hope in the eyes of the people who have suffered from oppression in the past." On Tuesday, the clergy met with around 35 clergy and lay ministers from the region. Archbishop Josiah asked them about their hopes for the future. They are very much looking forward to a Bishop who can live in their midst, not far away.